I’ve made it pretty clear in the past that I’m a big big fan of coconut oil. Not only have I used it for fat loss, cooking and on my skin in the past, I’m now using it to help me produce the best breast milk possible for little girl. Coconut oil, especially my fav brand Lucy Bee contains large amounts of lauric acid, a powerful anti-microbial fatty acid that protects the immune system of my newborn and increases the quality of my breast milk. The fact is a healthy balanced diet contains mixtures of saturated, monounsaturated and polyunsaturated fats, whereas the composition of human breast milk contains about 45 to 50 % saturated fat, about 35% unsaturated and 15-20% polyunsaturated. Lauric acid and capric acid comprise about 20% of total saturated fatty acids found in breast milk and have potent antiviral, antibacterial, and parasiticidal (kills parasites) properties that support the immune system. These fatty acids offer our babies protection from illnesses, viruses and bacteria. Coconut oil is also extremely easy for an infant’s immature digestive system to absorb and utilise, whilst providing energy in the form of medium chain fatty acids to help the baby grow and develop properly. According to the research, when a lactating woman adds foods rich in lauric acid like coconut oil to her diet, the amount of lauric acid available in her breast milk increases substantially to levels three times the original level and nearly double the amount of capric acid. Pregnant and nursing women also tend to store fat to aid breast feeding, and any lauric acid and capric acid in the diet becomes part of the adipose fat stores. The milk fat of a lactating mother is made up of these stores as well as her current diet. What this means is that a mother’s diet while lactating directly affects how quickly she sheds pounds once she stops breastfeeding. And since nursing mothers especially need fat in their diet, the trick is making sure it’s the right kind of fat. To make sure I get the right amount I start every day with a hot cup of water with lemon and teaspoon of Lucy Bee coconut oil, which is an excellent source of fat since it is a medium chain fat as opposed to animal fat which is long chain and much harder for the body to break down. Long chain fat stores will linger a lot longer on our thighs and hips than medium chain fats like coconut oil, which quickly convert to energy. 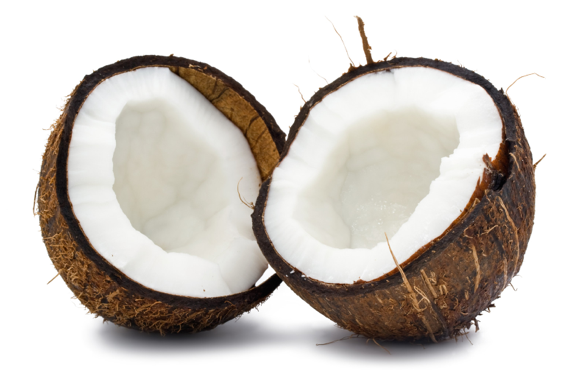 Here are just a few more of my fav coconut products! Lovely and creamy, and nothing else but high quality coconut oil, I wont use anything else when it comes to coconut oil. Not only do I put it in my morning hot water, but I also use it on my skin and baby’s skin too – it’s great for making you super soft with no hidden nasties! CO YO is a gorgeous creamy coconut yogurt made from nothing else but coconut milk. It’s dairy free, vegan and sugar free too. Again it’s perfect of you need a quick snack to help keep your energy up and top your milk producing calories up. It’s estimated that you need an additional 300-500 calories a day to support breast feeding. Coconut water is gorgeous. It’s full of potassium and great for rebalancing your electrolytes and keeping you hydrated. Have you ever noticed how thirty you get when breast feeding? I love that it comes in a coconut – fresh from the tree. No packaging required!